The Fruits and Vegetables Challenge is a fun way to encourage employees at your worksite to eat more fruits and vegetables every day. 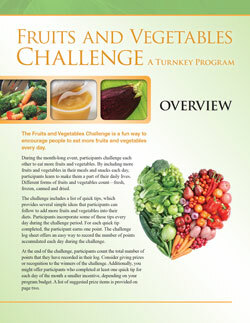 The Challenge is designed as a month-long event when participants compete to score points by eating more fruits and vegetables. By incorporating more fruits and vegetables into their meals and snacks each day, participants learn to make them a part of their daily lives. The Challenge Overview provides step-by-step instructions and guidance on organizing the event. Several other related materials needed for the Challenge such as an announcement poster, sign-up sheet, quick tips sheet, Challenge log to track points, weekly newsletters, evaluation form and certificate of achievement can also be downloaded here.